"Just like in the movie, today we’re doing a swap. If you could switch chronic diseases, which one would you choose to deal with instead of diabetes? And while we’re considering other chronic conditions, do you think your participation in the DOC has affected how you treat friends and acquaintances with other medical conditions? (Thanks to Jane of Jane K. Dickinson, RN, PhD, CDE and Bob of T Minus Two for this topic suggestion.)" 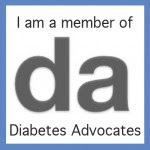 I can't pretend to know what it's like to live with any chronic condition other than Type 1 Diabetes. I really can't. But what I can do is empathize with anyone living with any chronic condition. As different as it might be from diabetes, there are still some things that are the same. I've written about this before, especially in regard to a couple books written by Richard M. Cohen. I have Type 1 Diabetes. That's the chronic condition I live with. I know the ins and outs, the frustrations and joys. The things that it's impossible to know unless you live with T1D. That's what makes the Diabetes Online Community so magical. Talking with people who have the same chronic condition is a powerful thing. In high school, I had the amazing opportunity to serve on the Teen Advisory Board at my local children's hospital. I will always be grateful for that experience. It was the first time I learned that chronic illness of any kind has a common language. There were five or six of us on the board with T1D. But the board represented the entire hospital. There were several teenagers living with cancer. A girl living with Chron's disease. A boy with Cystic Fibrosis. And I'm sure there were others--it was a long time ago. The hospital was a familiar environment for all of us. That's why we were there. And I didn't feel alone. These other kids spoke my language. The language of chronic illness. If you live with or love someone with a chronic illness, than you know the language. The hospital visits and doctor's appointments. Dealing with health insurance companies. Trying to figure out how to pay for what insurance doesn't cover. Finding the right doctor. Finding the right medications. Dealing with medication side effects. Adjusting to new/worsening/changing symptoms. Worrying about the future. Worrying about loved ones. Dealing with the psychological and emotional consequences of chronic illness. Taking care of a chronic condition day after day, while still having a life. Trying to hold onto your sanity. Since high school, I've met other people living with different chronic conditions. Rheumatoid Arthritis, hypothyroidism, bipolar disorder, clinical depression. And I'm very close to some amazing people living with Multiple Sclerosis, Alzheimer's disease, and chronic migraines. I cannot know what it's like to live with any of these conditions. But if you live with any chronic illness, we do share a common language. There is much that is the same. And we need one another to make it through. Also: the invisibility of the condition, the good days and the bad days, and the skepticism of some in your life that there's really anything wrong.